of the subtle beauty of her environment. but physically touch one's spirit. Joyce has taught at various art centers in New Jersey and has won numerous awards and honors for her work. Her paintings have graced the covers of books and magazines and can be found in many public and private collections thoughout the US and Europe. 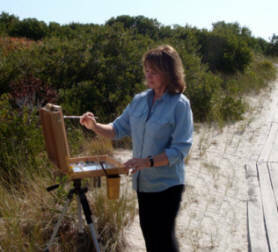 Lawrence currently exhibits her limited edition prints at her Lakeside Gallery in Tuckerton, NJ. She has also been represented by The Gross McCleaf Gallery, Philadelphia, PA, The M.T. Burton Gallery, Surf City, NJ, The Swain Gallery, Plainfied, NJ. and Gallerie Hippocamp, St. Jean Cap Ferrat, France. Lawrence studied art at Ocean County College, Stockton State University, Pennsyvania Academy of Fine Art and Studio Incamminati, Philadelphia, PA.